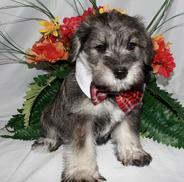 There seems to be a lot of controversy or “mis-understanding” on the discussion of “accepted” schnauzer colors. The reality is that it comes down to an understanding of genetics and the power these exert over our dog’s hair follicles. 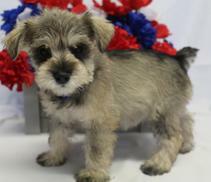 In this article I will attempt to clear up any confusion about the various colors and the genetic forces Miniature Schnauzer Puppies demonstrate. 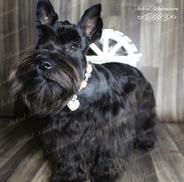 It is undisputed that in the beginning, Miniature Schnauzers were developed by “breeding down” or reducing the size of the Standard Schnauzer by cross breeding the Standard with various other breeds of dogs. There is some question as to which breeds of dogs exactly were used but it has been said that likely candidates are Affenpinchers, Poodles, Brussels Griffon, Miniature Pincher and among some lesser known sources, further speculation is that there has also been Pomeranian as well as some other smaller, toy-sized breeds. 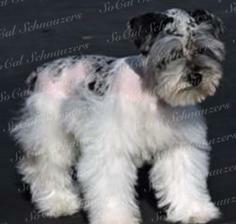 While the original intention was to breed for a “scaled-down version” of the Standard Schnauzer in every way (build, temperament, instinct to “rat” and coloring), human beings’ less-than-perfect understanding of genetics at that time (1880’s) shows in the concept to limit the “acceptable” colors to those of the Standard Schnauzer, despite clearly using dogs of differing colors (Poodle coat variations being among the strongest example) in the creation of the breed. Nothing makes this lack of understanding clearer than the original mistake of classifying the Black & Silver as a Salt & Pepper for enough years that once the mistake was discovered and understood, it was far too late to rescind the registrations of dogs who either were or produced that particular color. 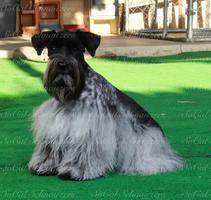 The Standard Schnauzer only has 2 colors, Black and Salt & Pepper. It appears that it wasn’t until breeders realized that this Black & Silver color bred “true” when 2 dogs of this coat color were bred together, that it was most certainly a coloration of it’s own, genetically speaking. Also if we look back at the first recorded studbooks from Germany, we will find that the Salt & Pepper actually was recorded less often than the other colors, including some of the controversial colors as well as some that are rarely seen even today including but not limited to Red, Yellow and Blue. It would probably be wise at this point to say a few words on inheritance so that when we start talk more in depth about the colors, the vehicle for passing on various genes is understood. This is an extremely simplified explanation simply for the purposes of our discussion. 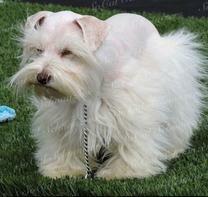 If a genetic trait is recessive, a dog needs to inherit two copies of the gene for the trait to be expressed, or seen. Unless it was created by a mutation which has been seen to happen. This is how all different colors first appeared, the same thing goes for eye color in humans and animals as well. Generally, both parents have to be carriers of a recessive trait in order for an offspring to express or show that trait. If both parents are carriers, there is a 25% chance with each offspring to show the recessive trait. If a dog shows a color that is known to be recessive, then they have inherited the gene from both parents making it double recessive and if that dog is bred to another that shows the same recessive color then that color will always “breed true”, meaning they will only produce puppies of that color. So Black & Silver is double recessive and bred to another Black & Silver will only have Black & Silver Puppies because the only genes the parent have to contribute are Black & Silver. (See table below.) Red font indicates mother’s genetic contribution and blue, the father’s. The recessive genes will always “mask” or override dominant genes when inherited from both parents. If a genetic trait is dominant, a dog only needs to inherit one copy of the gene for the trait to be expressed. The dominat gene can be “masked” by the doubling of recessive genes. 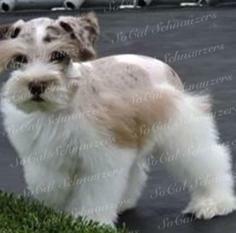 For example, all Mini Schnauzers carry the genes to be Salt & Pepper but if they inherit the genes to be White from both parents, the Salt & Pepper is covered or “hidden” and the dog’s coat is White. This means that if one gene is present it will manifest fully, and if two are present it manifests no differently than with one. As an example take a S&P male with no White gene being carried bred to a White female. Since he has no White gene and she had a masked S&P gene, the resulting puppies will all be S&P (but will also all carry for the White gene), provided no other matching recessive genes are carried and passed by the parents. Genes that are dominant direct inheritance cannot be “hidden” or “carried”. They must be directly inherited from a parent. They cannot “skip” a generation. An example is a puppy that is “One Color” (see explanation paragraph and color table in section on color below), one of the parents must also be “One Color” (not necessarily the same base color). Homozygous means that they have doubled up dominant genes thus ensuring they can produce no other color. 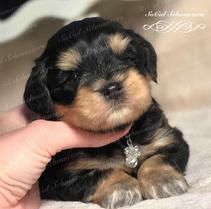 Example is homozygous “One Color” Black, meaning all puppies from this dog will be Black. One cannot ensure “One Color” Chocolate because brown-base is itself recessive, thus requiring the brown-base recessive gene from both parents, recessive genes cannot be homozygous. Further, in order to be homozygous, both of the homozygous dog’s parents have to be that color, but the flipside is not true…just because both of a dog’s parents are Black, it does not necessarily make the dog homozygous. The exception to this is if the dog’s parents are both homozygous themselves, then all their offspring must be homozygous. Heterozygous is the opposite of homozygous. It means that the dominant gene is not doubled up and the dog is carrying “hidden” or recessive gene(s), which can be expressed in the proper mating. So obviously the possible combinations are 25% homozygous Black, 50% heterozygous Black and 25% not Black. So if the dog is not Black, what color is it? This is where the other “notches” come into play. 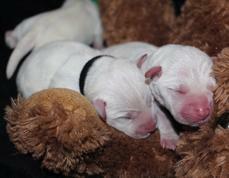 The dog will have other genes to determine what color they will be when they are not another color. It appears however, as though all Mini Schnauzers carry for Salt & Pepper and that it can be masked or hidden by other genes and when the other genes fail to be expressed, then the S&P gene fulfills the need. At this point let’s leave this subject where it stands and move on to the colors themselves. 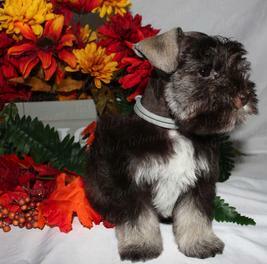 So now let’s explore the various colors we find in the Miniature Schnauzer. Firstly, for the purposes of clarity, let’s describe the genes a little differently for the purposes of this discussion. A dog with a true white coat (born with pink pads, lips and noses that later turn the base color) we will call a “no color”, a dog with a solid, one-color coat (ie. a solid black), we will call a “one color”, a dog with a 2 color coat, (ie. Black and Silver) we will refer to as a “bi-color” and finally a dogs with a Salt and Pepper type coat will be called a “banded” coat in reference to the banded characteristic of the wire hairs of the Salt & Pepper coat which gives it it’s distinct appearance. Parti colors will be discussed later and referred to as parti. To begin with, it first needs to be understood that there are 2 base colors, brown (also called chocolate and liver) and black (what is most commonly seen) . These are easily distinguished by the color of the nose, pads and skin. Within each of these 2 base colors there are the 4 genetic patterns as we outlined in the previous paragraph. Please see the table below to better understand how these are displayed. Base Color – Black, the “default” or dominant base color, any 2 dogs bred together that do not carry or pass on the brown-base will always pass on the black-base, which is why it is the most common base color seen. Base Color – Brown, recessive to the black-base requiring both parents to pass the gene to the offspring to show this color. This also means 2 brown-based dogs bred together will only produce brown based offspring. See ‘double recessive’, above. A white, also called a black-nosed white or a “true white”, this color has been documented through written description and photograph from the beginning and is accepted as a purebred without question in it’s native Germany as well as several other countries. This gene actually prevents the expression of the color, rather than being a color itself. Most often called a “white chocolate” or a “brown-nosed” white, this is genetically the same coat is the black-nosed white, only the base color differs. The coat color of the black-based one color reflects the skin color making the coat color black. While there are actually many genes responsible for the “shade” of black, in this section we are only addressing the gene which makes the dog genetically “one color”, in this case black. Once again the coat color reflects the skin color and makes this “one color” a chocolate color, also called liver. The shade can once again vary but the gene responsible for making this dog genetically “one color” is the same as in the black. Often called Chocolate the correct term is Liver & Tan, this is the bi-color gene as displayed within the context of the brow base. The “tan” points can range from a creamy, almost white color to a deeper nearly as dark as the chocolate of the main body color. 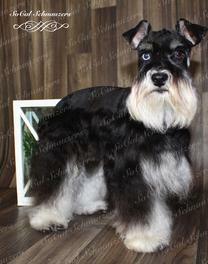 This is the most commonly known color for Mini Schnauzers as it is the color they are when they do not inherit any of the recessive or direct inheritance genes from their parents. 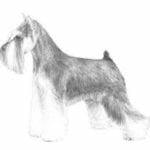 Although they come in a variety of shades, even as dark as a Black & Silver, the defining trait of this color is the “banding” of color on the wirehairs. 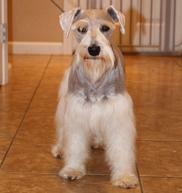 Upon closer inspection of the wirehairs when long, there is a distinctive banding or striping of lighter and darker coloration. The darker coloration will correspond with the base color, in this case black. The brown-base version of the “banded” gene is often called a Liver Pepper although that is somewhat misleading and confusing since there is no black “pepper” color involved.it would be more accurately known as a “frosted chocolate” to describe the “frosted look the banded hairs give the overall coat. It should also be said that “banded” coat colors, regardless of the base, also have the same Chinchilla “points” as the Black & Silvers at their eyebrows, checks, muzzle/beard, chests, lower legs, and under the tail. There are 2 base colors, Black and Brown. The base color of the dogs is always reflected in the color of the nose and pads. These base colors have been in existence since the beginning of the breed and have been well documented, at least in the beginning.. 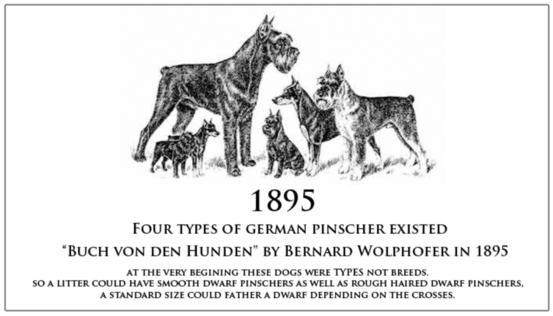 The first studbook of recorded Miniature Schnauzers lists a number of dogs, including at least one from the first recorded litter as being “gelb” German for yellow. The Yellow coloring is directly related to the Brown base, and the Yellow coat coloring is simply a difference in the way the color is deposited in the hair follicle. The claim that the Brown base is a “new” color and therefore not purebred is inaccurate. As it is recessive, it is possible to pass the gene on for generation after generation without it showing up and further, the very, very dark Brown based, One Color, Chocolate dogs can look almost Black and could easily be accidentally misidentified and registered as such, further continuing the genetic line. It has also been proven that there have been many breeders who have “disposed of” or purposefully misidentified the coloring of the “differently” colored dogs to preserve their “integrity” among the circles they turn in. (Recessive) True ‘No Color’ or White puppies are always born with predominantly pink pads, lips, eye rims, noses and skin and completely White fur. The lips, pads, noses and eye rims will quickly change to reflect the base color, black or brown. There are some dogs which upon maturity appear White but these are not true Whites. They are born a light tan color and as they age they fade more and more until they appear White (note the progression of color change in the first series of pics below). 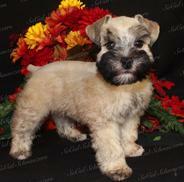 As puppies these are sometimes described as Wheaten or Platinum/ Platinum Silver. 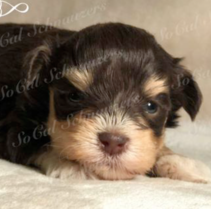 They will also sometimes seem to have pink-ish on the nose and perhaps even on the pads if they will have white markings on the toes, but this is not to be confused with the true pink of a White puppy. The “false white” appears to be a Dominant Direct Inheritance gene, needing one parent of that color to be passed. (Dominant Direct Inheritance) Puppies with the One Color gene will always be the color of their base color so their genetic color will always be the same as their nose/pads color. Because there are more genes involved with shade and thus color is not simply determined by the single gene, a One Color gene dog can look very different from another dog of the same One Color gene. There can be genes which determine that a dog fades and these genes will also control to what degree a dog fades, where they fade (full body, beard only, legs only) and what color they will fade out to. Below you will see a variety of Black base, One Color gene dogs that appear different based on the genes controlling shade/fade. As you can see many of these Blacks have colors other than Black in their coats, ranging from minimally to in entirety. It should be noted that the genes responsible for fading often don’t start to affect coat color until some time after birth and how quickly or even if a dog fades cannot be determined at birth or even necessarily by 8 weeks. 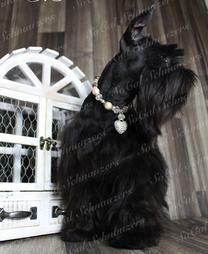 Also there was a time period when in Germany the only registerable Black Mini Schnauzers had to both have Black parents, this resulted in Homozygous Black dogs. Some of these were later imported into North America and are responsible for a large infusion of Black into the lines here. (Recessive) The Bi-Color gene is what makes a Black & Silver or a Liver & Tan and is the same gene responsible for the Black & Tan in other breeds. 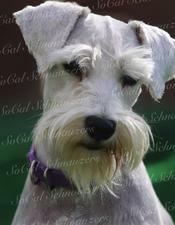 As mentioned before, the Schnauzer has what is known as the Chinchilla gene, which converts the “Tan” points to the silvery or white color the Schnauzer displays. Once again other genes are responsible for how dark or light the points and body appear and what, if any fading occurs. 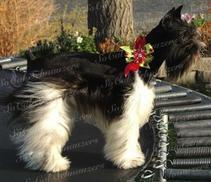 The wire hairs of Bi-Color dog are the same as the Base color. 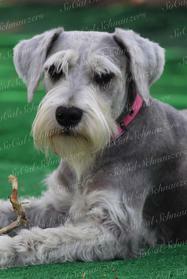 The Banded coat is the most commonly known Schnauzer color. 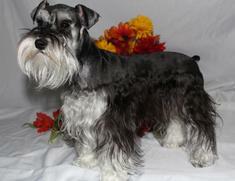 It is also the color Schnauzers are when no other genes come into play making it a kind of “default” color. The defining characteristic of the Banded gene is the distinct banding or striping of the wirehairs. 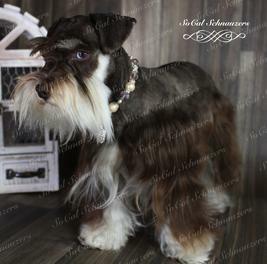 Depending on the point of growth of the wirehair, the hair will appear white, dark or a combination of both. The dark color always corresponds with the Base color. 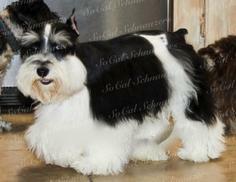 Again, other genes affect the shade of the Banded coat and this clearly seen in the pictures of the Black-base, Banded coat (Salt & Pepper) dogs below. Despite the fact that the top right picture appears to be a Black & Silver, upon closer inspection the banded wirehairs can be seen and prove this to be a Banded coat. Banded coat puppies are often born with various amounts of a tan shaded coloration to their coats (see photo on left) that most often fades out as they age, although on occasion it doesn’t fade entirely. This is normal and even noted in the breed standard of the AMSC and AKC. It is now the time to address the Parti–color gene. separate from the other color genes since it can be displayed simultaneously with them and is a “pattern” gene also known as a “broken color” gene. 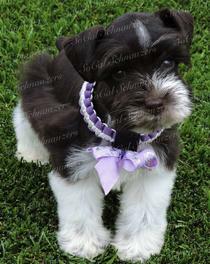 There have been recorded Part-Colored Mini Schnauzers in this country as far back as the 1950’s and can be traced directly to some of the well known and respected German Kennels. The Parti coloring can be seen as big “saddles” of color on a white background or as a “splattering” of colored freckles on the white background, or more commonly, both. It also needs to be said that you can have White Parti-colored dogs but you won’t see the Parti due to the White disguising it. 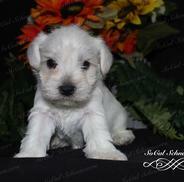 You won’t know you have Parti until you breed to another non- white Parti or Parti gene carrier and get Parti puppies. 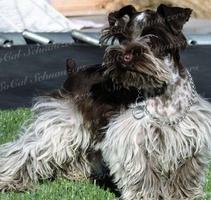 All schnauzers have a combination of these genes we have discussed. 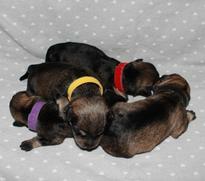 Each one has a Base color gene, a Coat pattern gene and an optional Parti pattern gene. Whether these are displayed or not sometimes depends on whether the gene is “turned” on or off. Like in the case of Black, as a dominant gene it is either inherited as Black or Not Black. With the recessive genes it is a matter whether or not two matching gene pairs are inherited, one from each parent. I hope this helps clear up some of the confusion regarding the colors. I also want to be sure to make it clear that to say that the non-standard colors are “not recognized” by the AKC is not accurate. 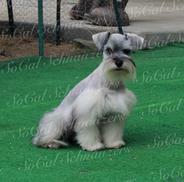 They most certainly are recognized otherwise they would not be able to be registered as purebred Miniature Schnauzers. 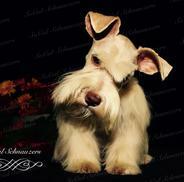 They are registerable and recognized, simply not able to be shown in the conformation classes. They can still participate in Agility, Obedience and Search and Rescue. Just so that is clear to all. Thank you for taking the time to read this. I hope it was informative.